The oldest equity crowdfunding market in the world is the UK. That market began in 2011, and has grown with an average annual growth rate of 410%. It took until 2013 for angels and VCs to take much notice of equity crowdfunding in the UK. Now it is commonplace to see co-investment – 43.3% of UK angels invested through equity crowdfunding in 2014. We’ve also seen the first publicly listed company raise funds through equity crowdfunding. And we’re currently watching the first offer from a company that intends to list immediately after the offer closes. 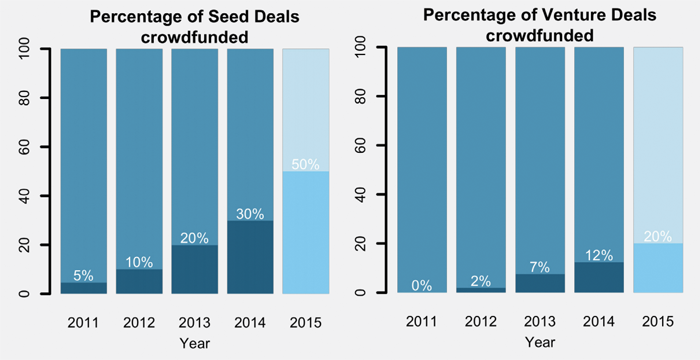 30% of seed investment in the UK was sourced through equity crowdfunding platforms in 2014. That figure is estimated to be 50% in 2015. We’re keen to shortcut the time taken to get angel / VC buy-in to equity crowdfunding in New Zealand. Here’s my thoughts on how angels groups / VCs can benefit from working with equity crowdfunding platforms in 2015. Angel groups and AANZ do a good job of shining a spotlight on funding of early stage businesses. However awareness is still too low, and angel groups can appear exclusive or inaccessible to many investors who would be eligible to participate. Accessibility: Investment opportunities are broadcast widely, reaching many who would otherwise not hear about these opportunities. Small investments: Most equity crowdfunding offers have a small minimum investment amount, such as $500 or $1000. This enables people to start investing in this asset class earlier in their lives. You can easily diversify $10,000 across a range of investments. Learning: One problem with growing the number of angel investors is education. People will be reluctant to invest if they don’t feel that they know enough about the space. Equity crowdfunding gives newbies access to the same offer information, Q&A, and commentary as experienced investors. So everyone is part of the same conversation about an opportunity. Many future members of angel groups will first invest in unlisted equities through equity crowdfunding. Angel groups should be aware of this, and should identify ways to use platforms as a feeder for their membership. Equity crowdfunding is carving out its space in the funding ecosystem. It will never replace angel investment or the other funding sources. That’s because some businesses are simply better suited to private angel investment or other channels. We’ve had expressions of interest in equity crowdfunding from nearly 600 Kiwi companies. We always ask ourselves what value the company should be trying to capture alongside the cash. If that value is deep domain expertise, for example, we’ll discuss whether introductions to suitable angel investors is the better path. As further examples, we believe that very early stage businesses are generally not suited to public offers. And companies that are best suited to funding through convertible notes are not right for equity crowdfunding (the regulations don’t permit offers of convertible securities). Companies should be aware of the range of funding options, and they should go with the option that provides most value to their business. We’re committed to referring companies elsewhere if appropriate, and hope that angels understand the equity crowdfunding option and can provide the same guidance to companies. Each offer through Snowball Effect has attracted multiple individual investments of $50,000 or more. Private investors are using this channel, and we’ll continue to build that part of the market. This week we will be assisting Breathe Easy with NZ's first early stage co-investment opportunity between the public and institutional investors. Breathe Easy has raised funds in this round from ICE Angels, Pacific Channel, New Zealand Venture Investment Fund, and other private angel investors, and will be raising the last portion of funds from the public through Snowball Effect. For angel groups, it provides an efficient way to top up a funding round. For equity crowdfunding investors, it provides comfort that sophisticated investors have assessed the opportunity and have committed. For the company, it’s an opportunity to harness the benefits of wide brand exposure and shareholder advocates that come with a public offer. We’d love to hear your feedback on these collaboration opportunities. Please get in touch with any thoughts or comments at [email protected] or 021 766 942. The final part of our investor series on direct private equity investing looks at diversification and portfolio construction. In the second part of our investor education series, we analyse private equity investment returns, and take a look behind the numbers at some complicating factors, including the 'power law'. Part 1 of 3: We look at different methods for calculating returns on private company investments. The FMA has recently released their annual data insights into NZ’s fintech space for June 2018. Of particular interest to us at Snowball Effect is how the online equity investment industry is continuing to develop.